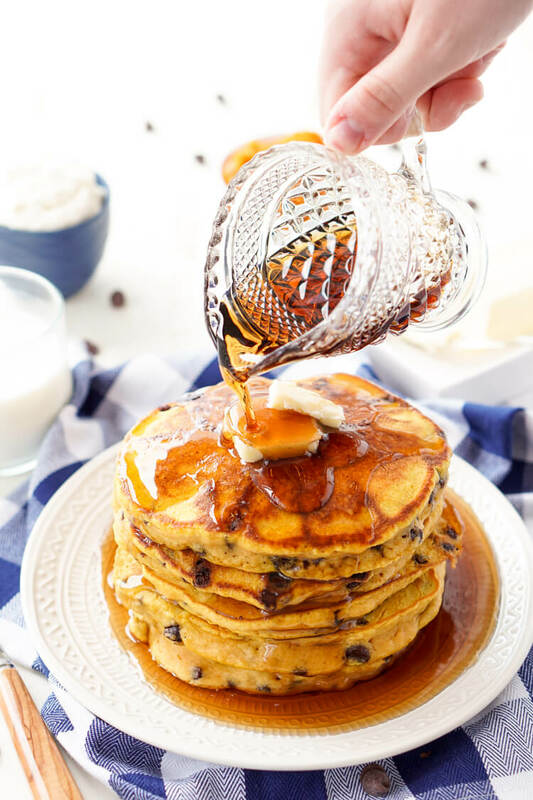 These Pumpkin Chocolate Chip Pancakes taste just like the classic fall cookie, except in this case you can drench them in maple syrup, smother them in butter, and eat them for breakfast! I swear Pumpkin Chocolate Chip Cookies start rolling out before the infamous PSL. And I get it, I totally do, those soft, chewy cookies are the complete embodiment of everything we love about fall and its flavors. Plus they make the house smell amazing when you bake them! 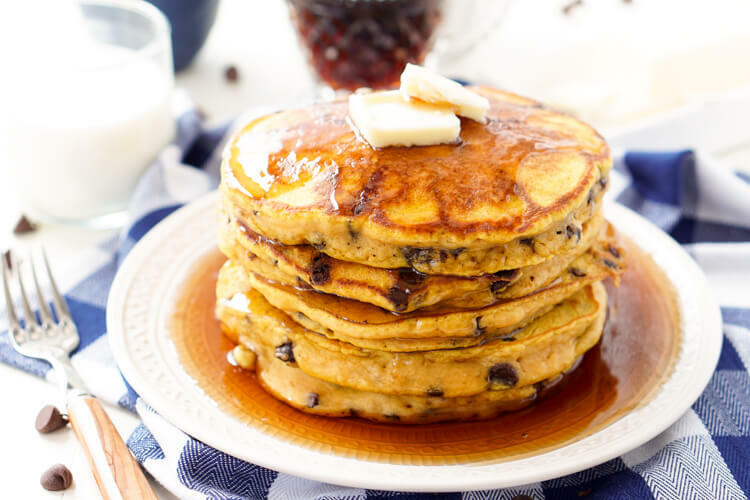 But today, we’re making it totally appropriate to eat your favorite fall cookies for breakfast with these Pumpkin Chocolate Chip Pancakes! 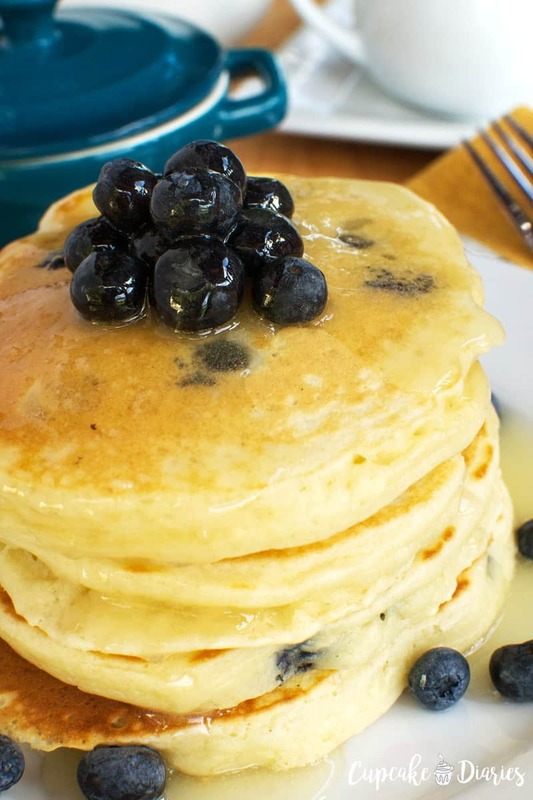 Did you know that today was National Pancake Day? Well, it is! 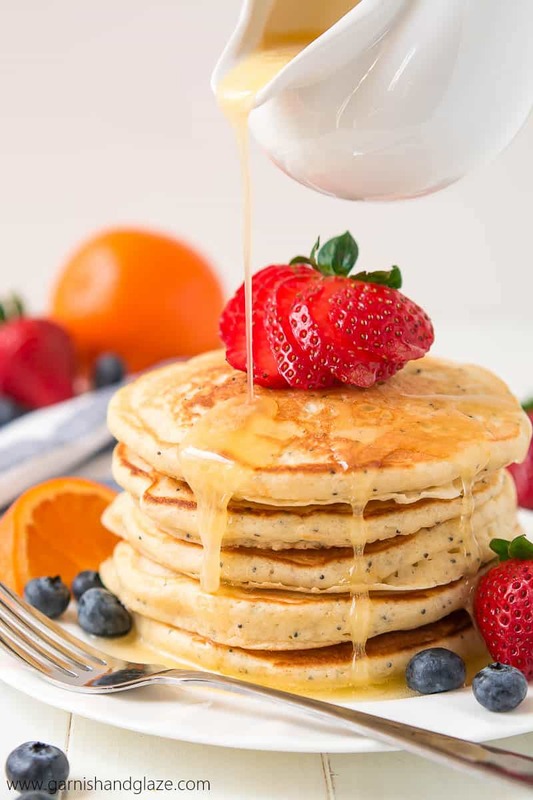 And since pancakes are one of my all time favorite things ever, there’s no way I was going to miss out on celebrating. Plus, it’s just another reason why September is the best month ever! 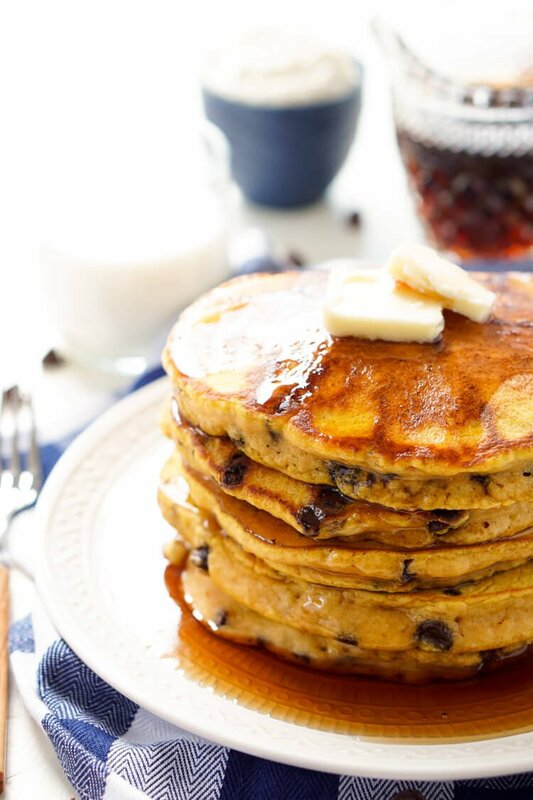 So let’s talk about these Pumpkin Chocolate Chip Pancakes, shall we? 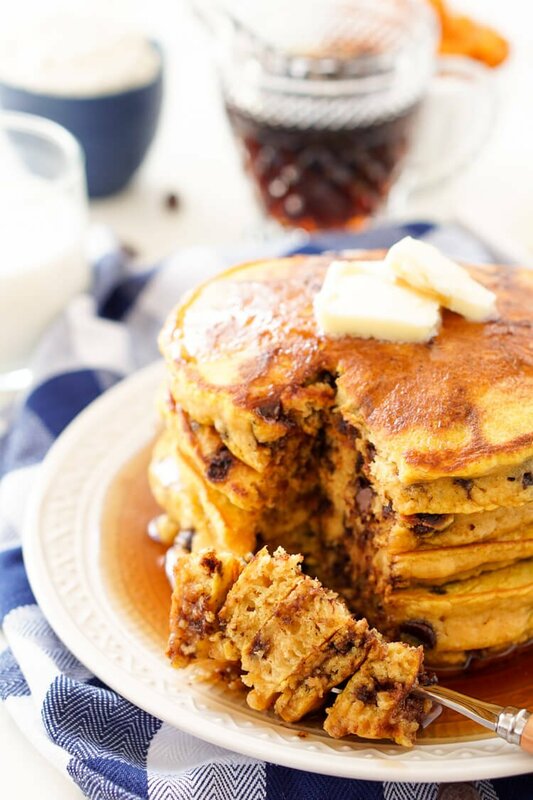 They taste just like pumpkin chocolate chip cookies, but once you add butter and maple syrup, well, they’re just over the top and delicious as hell! 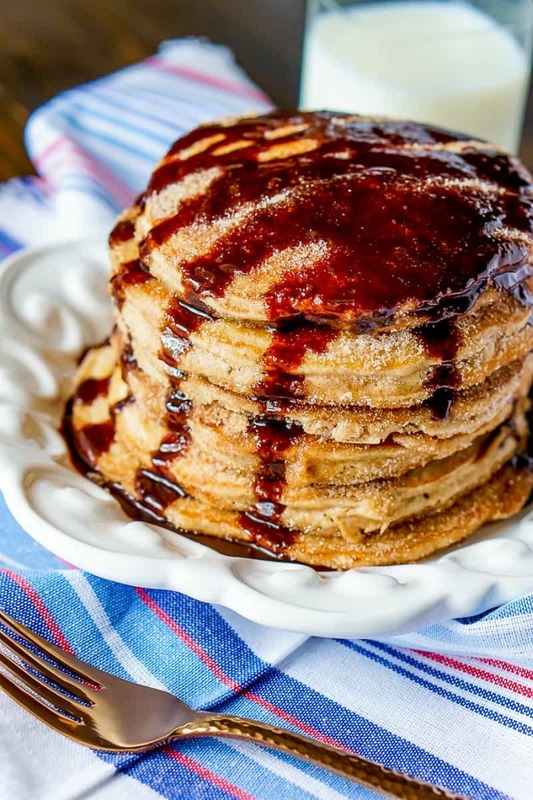 These pancakes are super thick and fluffy thanks to the ricotta that’s mixed into the batter. 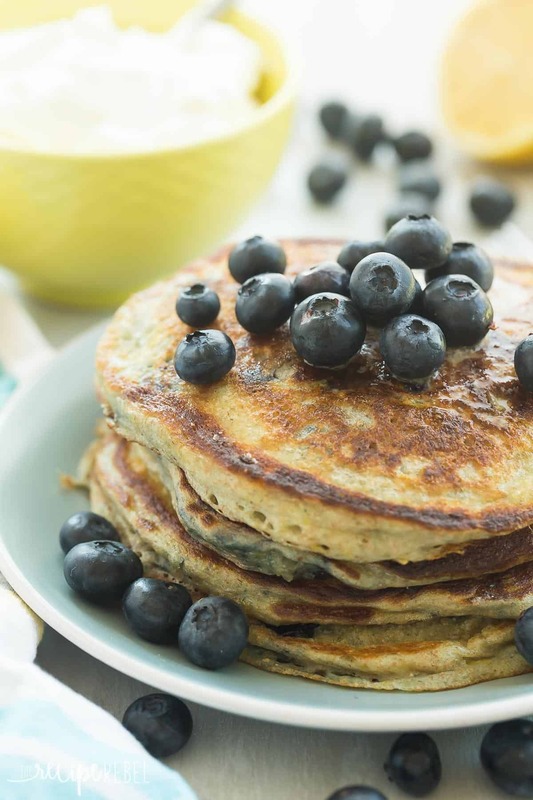 Plus, they’re perfect for fall mornings before heading out to pick apples and pumpkins! 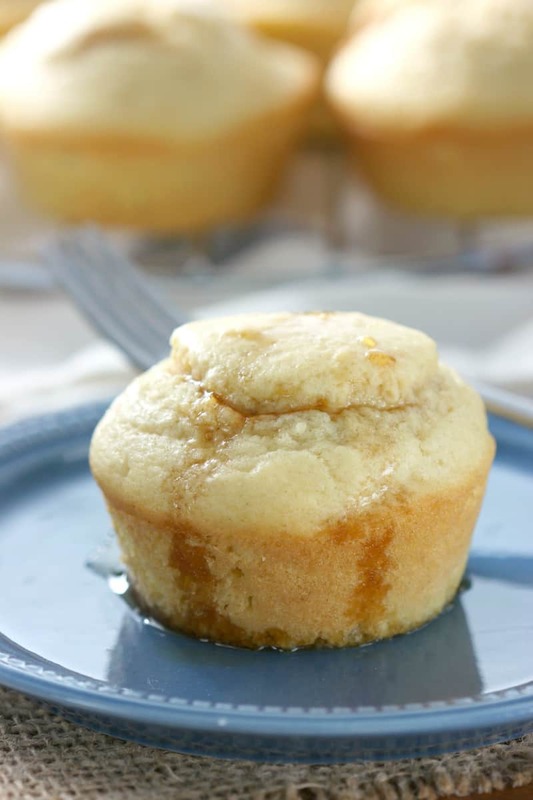 In a large bowl, not a stand mixer, combine flour, sugar, baking powder, baking soda, pumpkin pie spice and salt. In a separate bowl, stir together milk, ricotta, pumpkin puree, and eggs. Add wet ingredients to dry ingredients and stir until just combined. Batter should be a bit lumpy, do not over mix. 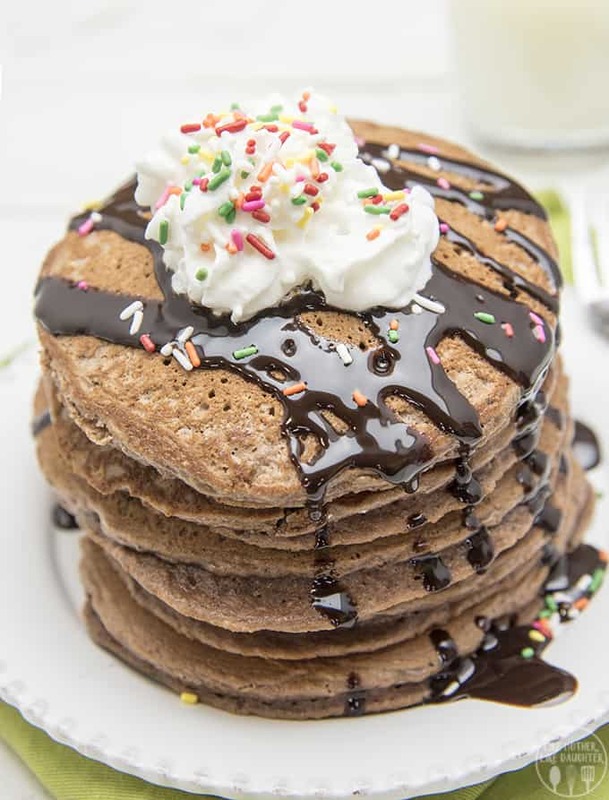 Gently fold chocolate chips into the batter OR sprinkle them on to the cooking pancakes. 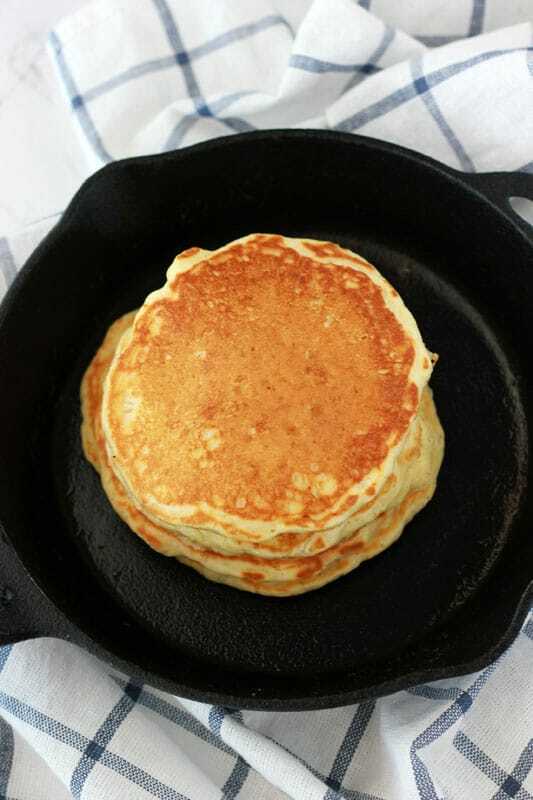 Spray griddle or large pan with cooking spray and heat on medium heat. 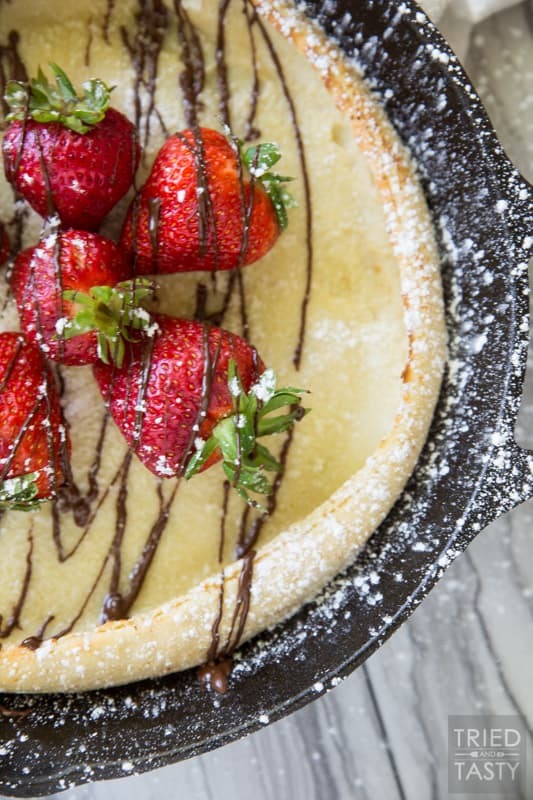 Use a ½ cup measuring cup to pour batter onto cooking surface. Cook for 1½ - 2 minutes until edges start to bubble, flip and cook the other side for about a minute until side is golden brown. Remove from pan, top with butter and syrup and whipped cream! 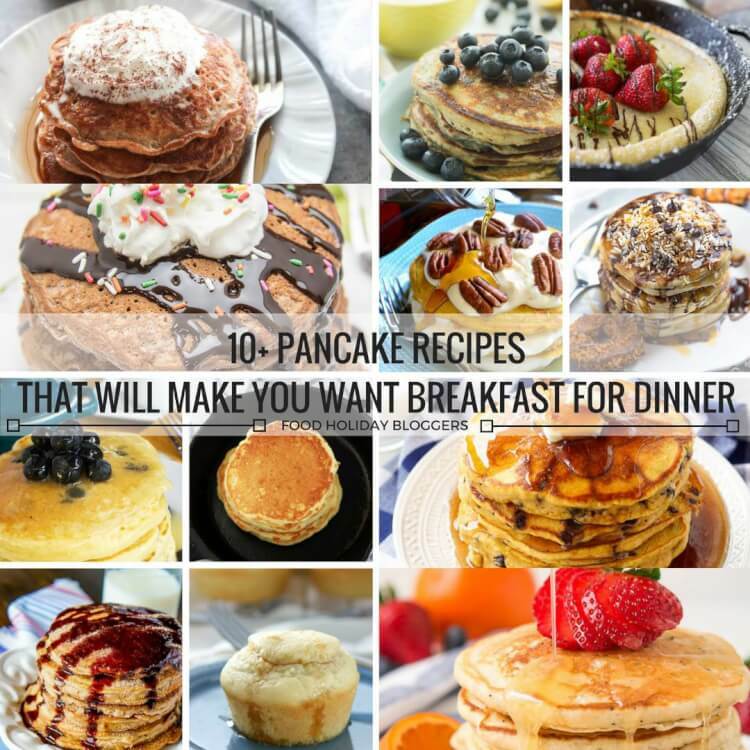 You might also enjoy these other delicious pancake recipes! These look and sound amazing! 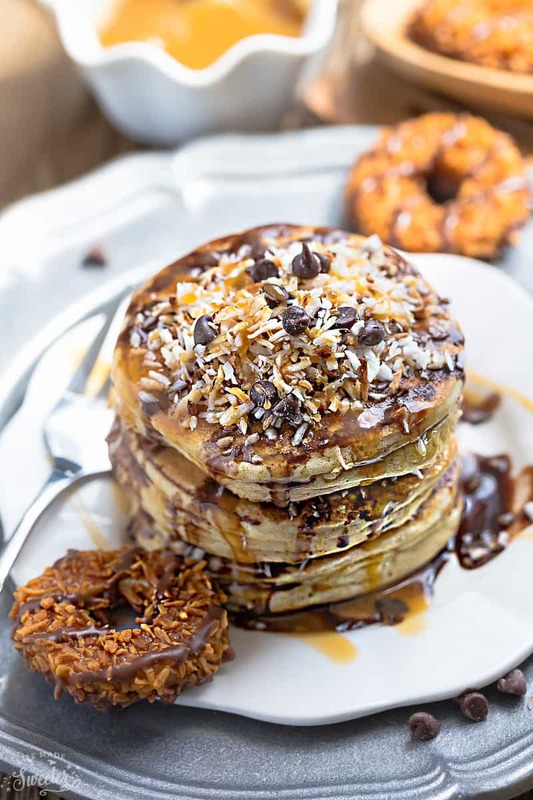 😀 Pancakes and fall are made for each other. So happy to find a fellow Maine blogger too! Hi Emily, I’m so glad you found me, I love connecting with other Maine bloggers, there are so few of us around! You’ve taken my favorite cookie and made it acceptable to eat for breakfast. You are officially my favorite person on the planet! Haha, thanks so much, Jesseca! 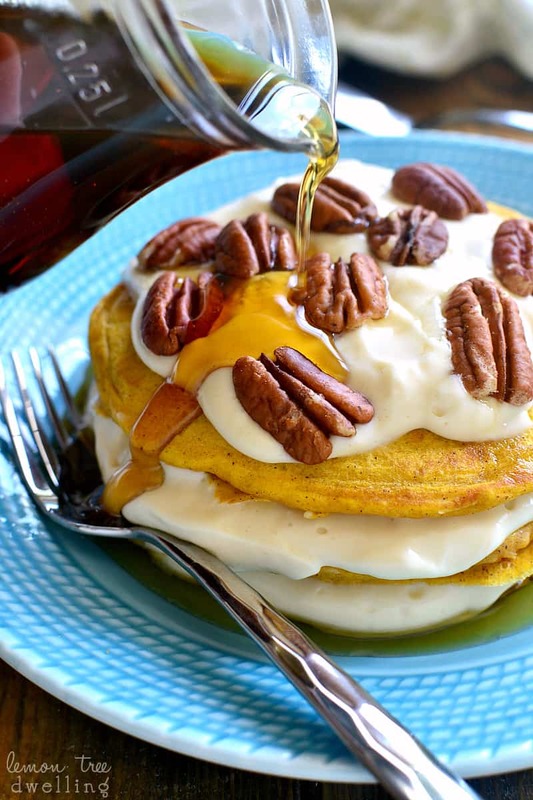 We just had pumpkin pancakes for the first time this season last week! 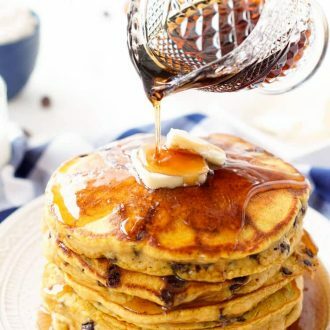 Love the addition of chocolate chips! YUM! 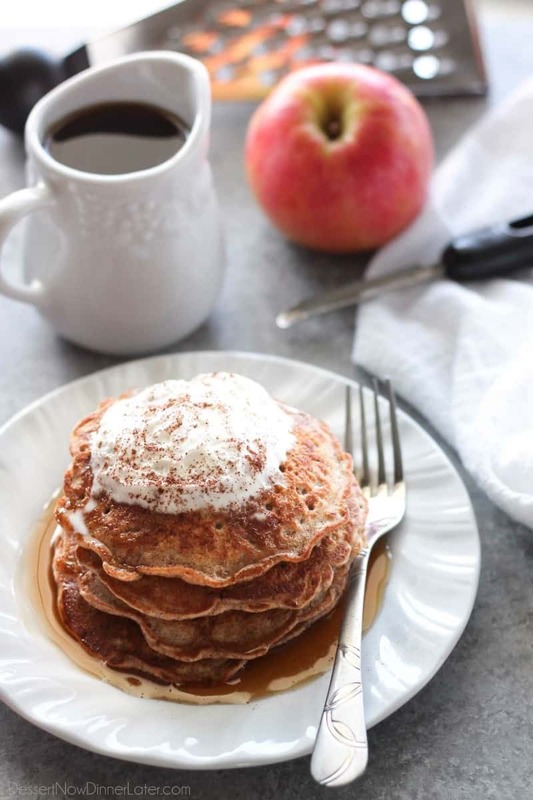 These are so perfect for a nice fall Saturday morning. 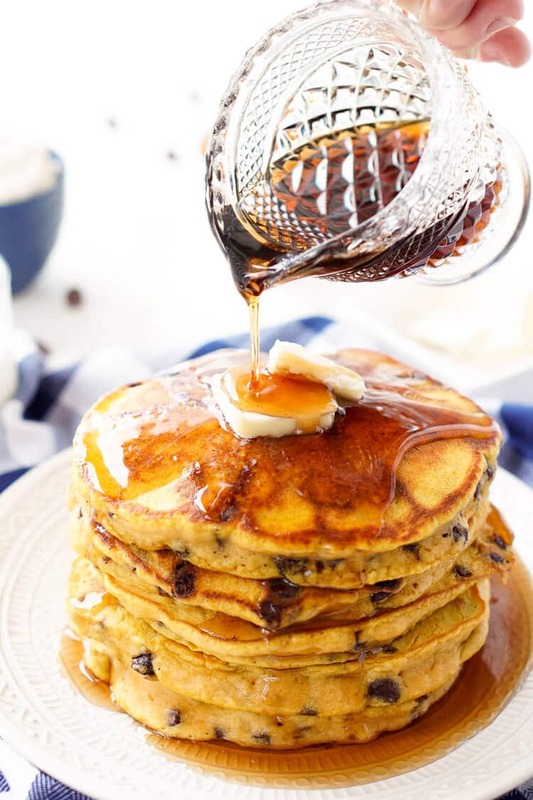 It’s like having a hug for breakfast! Love it! I don’t like ricotta cheese. Can you substitute it for greek yogurt or cottage cheese? Hi Ashley, I haven’t tried it so I can’t say, but you can’t taste the ricotta.